So, this was the scene at Avenue A and 3rd Street at 9:10am this morning. The third nestling had eaten breakfast and was just quietly sitting at the back of the nest, so I decided to head off to work. Eleven minutes later, this was all that was left. This little guy had us all fooled! I really didn't think it was going to fledge, so I've been kicking myself all day for not sticking around a few minutes longer. Oh well, I'm happy to have witnessed one fledge last Saturday. According to a witness on the street, the hawk suddenly flew up and circled over the building before gliding east. I went out later in the day to look for it, but didn't find it before the big rain storm hit. There was one photographer there in the morning who must have seen the fledge, so if you're out there, Mr Photographer, please let us know! 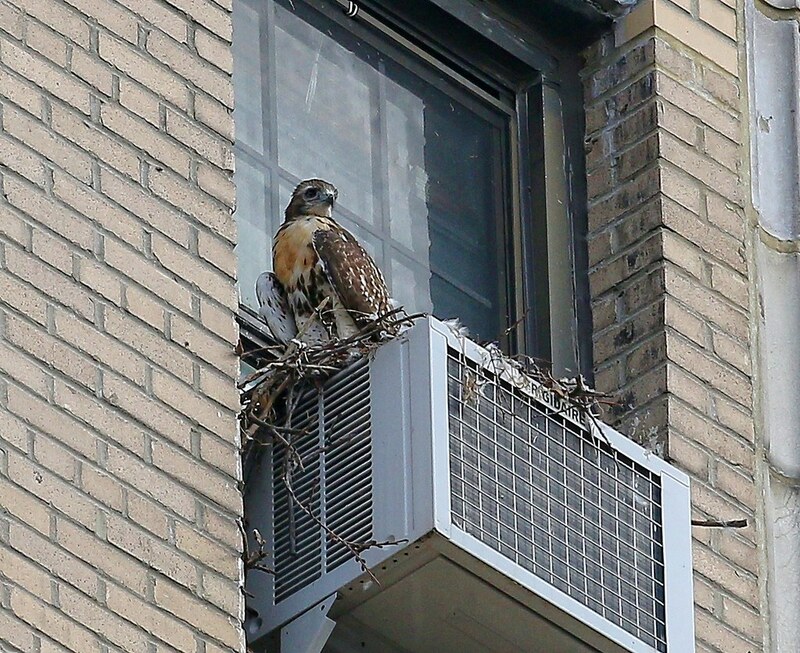 Two Hawks NYC has photos of the third nestling this morning before the fledge. For those keeping stats, this hawk hatched on May 3, making it 51 days old when it fledged. Fledgling #1 was also 51 days old when it flew and Fledgling #2 was 50-51 days old. 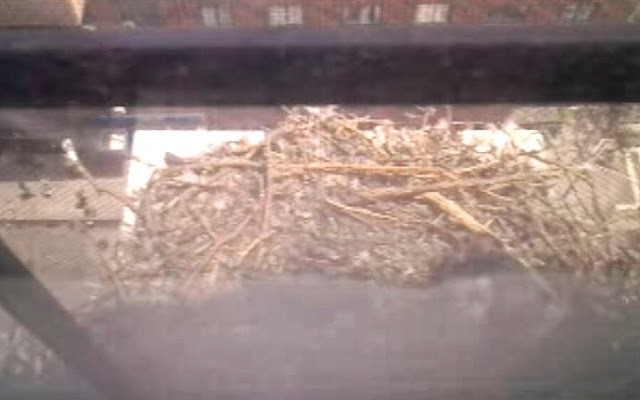 A big THANK YOU to the resident(s) of the apartment with the a/c who set up the web cam and allowed the hawks to raise a family right outside their window. Not only have we enjoyed watching them grow up, it's been a wonderful learning experience. The next phase is observing the fledglings as they explore the neighborhood and figure out how to be hawks. If you see one on a window, a/c, or anywhere else that looks odd, the bird is probably ok. But, if you feel you must call for help, please contact me or WINORR (Wildlife in Need of Rescue and Rehabilitation). They are experienced and can advise a course of action.